Providing students with the opportunities to cultivate their passion for music and equip them to engage the world. David Badley’s life was a symphony of music lessons and performance with a career in church and Hollywood music — until silence descended, after a 2014 diagnosis of stage 3 throat cancer. To assist in recovery, Badley — now in his mid 50s and a patient at Swedish Cancer Institute — enrolled in music therapy with Betsy Hartman ’10. 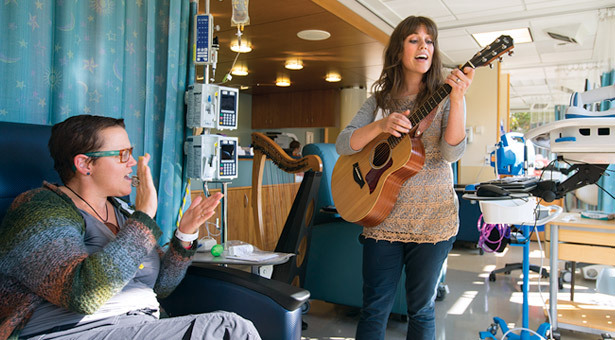 Hartman, 28, is one of the first two board-certified graduates from Seattle Pacific University’s music therapy program, launched in 2008 and accredited by the American Music Therapy Association in 2009. Hartman moved to southern California after graduating, then in 2014 moved back to Seattle to join the therapeutic play program at Seattle Children’s Hospital. On average, she treats a roster of 15–20 patients per week, ranging from infants to young adults. She now also owns PNW Music Therapy, a private practice, where she oversees music therapists who work in hospitals, retirement homes, and facilities for people with mental illnesses and intellectual disabilities. For young children, the goal is often to provide an alternate focus through music while they experience difficult procedures such as IV pokes or blood draws. With older children and adults, Hartman often teaches instrument lessons and, through those, coping skills. In addition to emotional expression, music therapy can enable rehabilitation goals. Beating a rhythm on a drum fosters endurance, functional motor skills, and strength training. Modern music therapy traces its roots to World War II, when community musicians performed at hospitals for veterans. Today at SPU, students of the profession must be proficient in guitar, piano, and voice. They also receive specialized training in one of three areas: physical therapy and exercise science, psychology, or special education. The major requires 120 hours of practicum work at one of Seattle Pacific’s dozen partner sites ranging from hospitals to homeless shelters. A six-month internship demands more than 1,000 hours of work at an accredited site.